Breakfast is always a struggle with my youngest. While I am happiest with Greek yogurt and a cup of coffee he expects a big breakfast. By big I mean waffles, sausage, eggs, grits, you name it. My oldest isn't a big breakfast eater, but he is picky. There are certain breakfast foods that he loves and others he won't touch. I have gone back and forth with breakfast. When I was younger I was horrible about eating much of anything in the morning. In college I ate sugary scones and coffee and survived on little else. Luckily I outgrow this habit, but my breakfast habits didn't get much better. Slowly since my kids were born I have transformed my eating habits and I now eat healthy breakfasts 99 percent of the time. One food that my whole family can agree on is waffles. I only make them on occasion, but they are always well received. This week I tried a new recipe for Georgia Grits Waffles from the November 2012 issue of Southern Living magazine. This recipe has 8 ingredients. It takes 50 minutes of total time, 25 minutes of which is active and makes 8 servings. I made two batches of this recipe, one gluten free and one as written. The only major change I made to the recipe was to use low-fat buttermilk and butter spread instead of butter. I made these changes based on what I already had in my fridge. For toppings I used pure maple syrup and frozen peaches. In the gluten free batch I used super fine grain brown rice flour, it would also work with sorghum or white rice flour. One word of advise about the grits. The recipe states to let them cool. Be careful since grits will turn into a solid mass, making for lumps in your waffles. I would suggest letting them cool slightly and being careful when adding the eggs. This way you don't have half cooked eggs in the batter and the grits will not be lumpy. My youngest really loved these waffles. He ate most of the regular recipe and then moved on to my gluten free waffles. The regular waffles came out fluffy and were great with butter. The gluten free waffles turned out slightly crispy, which was a nice with maple syrup. This would definitely be a recipe I would serve to my family again. For the recipe go to Georgia Grits Waffles. I love that this is gluten free for us celiac gals!! I was so excited to read this! Thank you for sharing! I can't eat gluten either, bad genetics :) The rest of my family does though, I just keep everything separate in the kitchen, different utensils, cutting boards etc. I am lucky that making breads and touching wheat, rye and barley doesn't give me a reaction. I know some people can't even touch the flour which would be hard in families that everyone else didn't have a problem with gluten. I can't have strawberries, so I understand :) Thanks for the sweet comments, I hope you come back soon! How tasty! 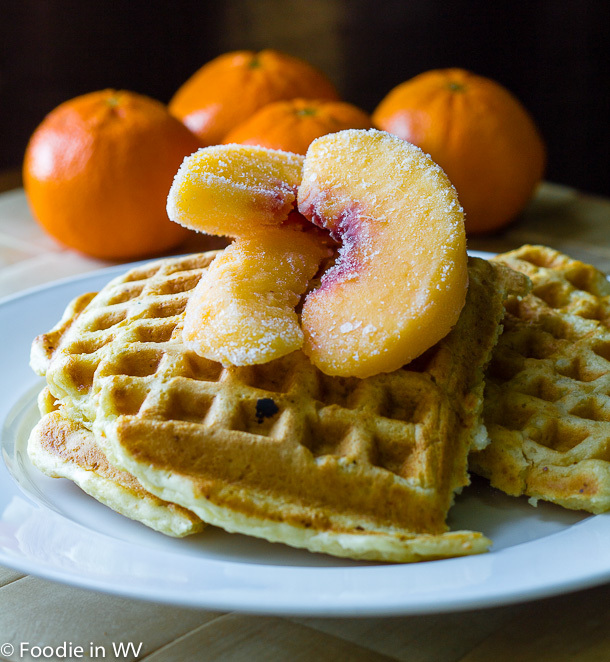 I usually put strawberries or blueberries on my waffles, but peaches sound awesome. I normally put blueberries on mine also, but we were out! I eat greek yogurt and coffee almost every morning :) I love Greek yogurt since it is so high in protein! This looks delicious!! And I loove peaches!! Thanks :) I agree about peaches! OMG your blog makes me hungry! 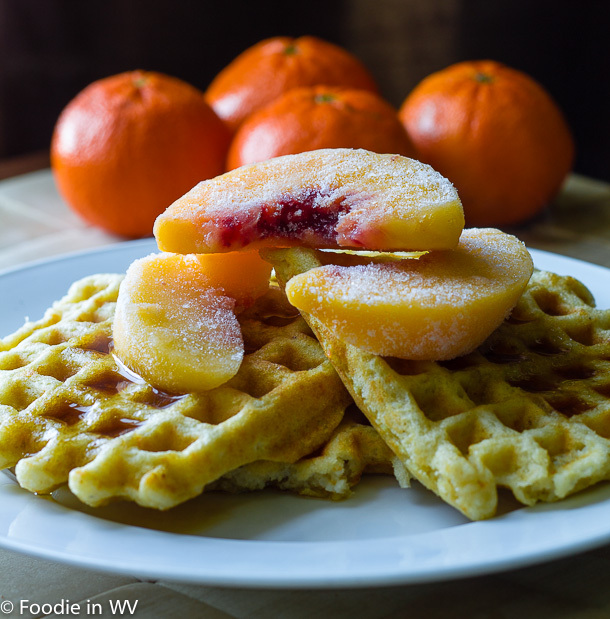 XD This looks great and I love peaches ^^ !Dropping by from the Weekend Social Mix Blog Hop. Peaches are the best! Thanks for the sweet comments, come back soon! Now that looks tasty and delish! Can't wait to head South on biz soon to have some great southern cooking! That looks fantastic! I don't remember the last time i had waffles, but I might have to change that after seeing this picture! My goodness those waffles look delightful. I cant so that much work in the week mornings but on saturdays these would be so wonderful for a long morning in the kitchen when I really want to cook!! I love peaches and grits!! This recipe looks wonderful, and I love the fact that it's Gluten free. Thanks for sharing on Foodie Friends Friday! Thanks :) My family can eat gluten, but thanks to genetics I can't. Thanks for hosting!